As of Jan. 1, 2019, the Arkansas minimum wage increased from $8.50 to $9.25 due to the approved minimum wage act during the 2018 midterm election, and Harding students have experienced the difference both on and off campus. 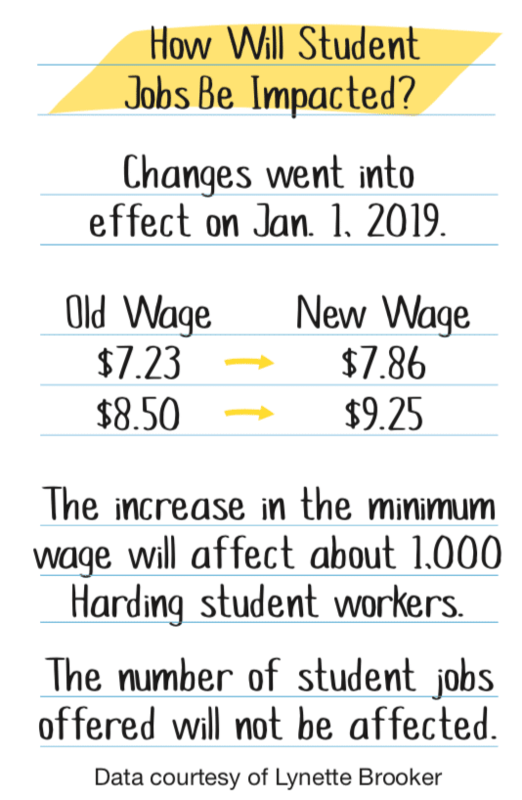 The increase in the minimum wage will affect about 1,000 Harding student workers, according to Lynette Brooker, director of budget and payroll. Brooker said the sub-minimum wage will adjust from $7.23 to $7.86 and the minimum wage from $8.50 to $9.25, and the university plans to pay for the increase out of the operating budget. “It should not affect the number of jobs on campus,” Brooker said. Aramark employs 135 students on campus, and according to Senior Food Service Director Lou Christopher, the payroll of all Aramark student workers increased to $9.25 per hour. “While the raise increase does create more of a financial burden due to increasing pay rates for both student employees and non-student employees, we still need the same number of employees on staff to get the job done,” Christopher said. Gracie Olderman has been the marketing intern for Aramark since March 2017, and she said she works 20 hours per week. Craig Russell, director of Public Safety, said the increase in the Arkansas minimum wage has also affected his department. Public Safety has not laid off any students or members of the staff, according to Russell, and he said they manage the number of hours that students work in order to maintain efficiency. Along with Aramark and Public Safety, the library is another popular place of work for students. Senior Makyra Williamson said she works seven hours a week for the library because she has another job as well. “Though I’m concerned about the long-term ramifications of the increase, I’ll be happy to get another [approximately] $5 a week without working more hours, especially since not all campus jobs pay the state minimum wage,” Williamson said. Many students also work off campus at places like Mr. Postman Expresso, Searcy’s combined coffee shop and post office. 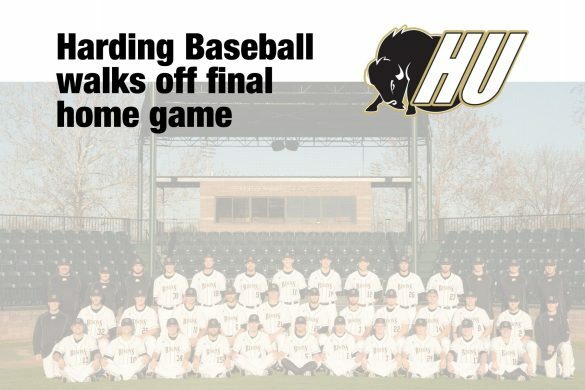 Owner Allison Dennison said she has hired Harding students for the past eight to nine years, and eight students currently work for her. Dennison said she pays most of her employees minimum wage, but she said she can make up the difference in other areas. As per the minimum wage act, the minimum wage will further increase to $10 in 2020 and $11 in 2021. On Jan. 16, Sen. Bob Ballinger introduced a bill that would amend the minimum wage act to exempt some employers from the pay increase. The exceptions would include businesses that employ fewer than 50 people and institutions of higher education, including Harding. Ballinger submitted an amendment to his bill on Jan. 23, which included an emergency clause that stated the General Assembly had determined any delay in putting the bill into effect would disrupt the business market. Ballinger’s proposed act will pass if Gov. Asa Hutchinson approves it, if Hutchinson does not approve or veto the bill in time, or if Hutchinson’s veto is overridden.